Marika McCoola has an MA in writing for children from Simmons College and is a former children’s book buyer at an independent bookstore in Massachusetts. Baba Yaga’s Assistant marks her publishing debut. She lives in Massachusetts. Emily Carroll is the author-illustrator of the acclaimed and best-selling graphic story collection Through the Woods, as well as numerous web comics. She lives in Stratford, Ontario. This is the opposite of a fairy godmother story, and that’s a very good thing. Baby-eating witches are way more fun. Carroll’s elegant drawings and lush colors are a perfect match with McCoola’s lighthearted and surprisingly heartfelt words. As a storyteller, McCoola is as shrewd as Masha and nearly as shrewd as Baba Yaga...There are all sorts of curricular possibilities here: exploration of folktale retellings, discussion about modernization, and even analysis of the use of the wordless panels and how art moves the story forward, but mostly this graphic novel deserves to just be savored as an old story yanked into modernity and told with aplomb. trong, complex characters and the inventive fusion of contemporary and fairy tale elements make this a noteworthy collaboration. Carroll’s dark yet luminous artwork is a perfect match for McCoola’s tale, particularly when she illustrates the classic Baba Yaga stories interspersed throughout...A perfect match for Deb Lucke’s The Lunch Witch (2015). McCoola's offering is a well-nuanced delight, satisfyingly blending fairy tale, legend, and thrills. As a perfect complement, Carroll's evocative art enthralls, capturing both the emotion and the magic of McCoola's yarn and breathing new life into an old folk tale. Though structured like a fairy tale, this clever and well-appointed graphic novel is refreshingly modern and obviously enjoys playing with conventions. A magnificently magical must-read for all fairy-tale fans. 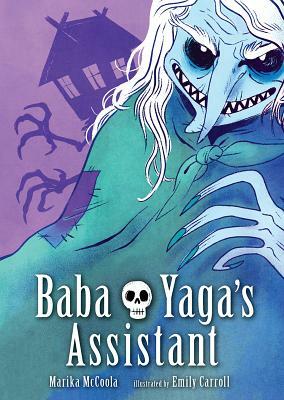 Upper elementary readers will enjoy how the illustrations create a moody and mysterious creepiness surrounding Baba Yaga. The characters are expressively drawn, adding drama to the story. Masha’s tween angst will resonate as she copes with her new family situation. This title will find a home with fans of R. L. Stine’s “Goosebumps” (Scholastic) and Luke Pearson’s “Hilda” graphic novel series (Nobrow). Comprised of short chapters, this graphic novel shines in its pacing, harmony of image and text, and use of flashbacks and stories-within-stories to advance plot. With vivid coloring, Carroll’s digital art establishes setting and tone. Rhythmic omniscient narration and ornate panel borders for the flashback scenes spotlight the story’s Russian folkloric roots. Readers...will delight in this retelling of a classic story as a graphic novel.